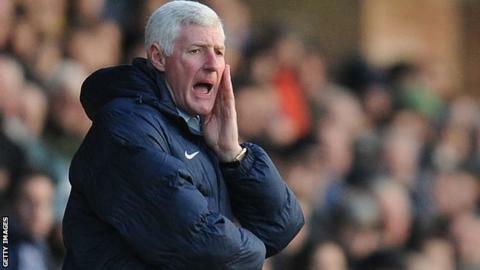 York boss Nigel Worthington feels his side will benefit from their draw at already-promoted Scunthorpe last week. On Saturday, York face Fleetwood in a home League Two play-off semi-final first-leg after finishing seventh. Worthington's side, who are on a 17-match unbeaten run, were 2-0 down at half-time at Glanford Park. "I sensed before the game that we weren't mentally right and the first half showed us what happens when that is the case," he told BBC Radio York. "We we weren't ready for the game. The mental side of things will be key on Saturday and we will be ready. "It was a nice little wake-up call because in the second half we were back to the resilience, character and endeavour I expect." The Bootham Crescent side have turned their season around after only being out of the relegation zone on goal difference at the turn of the year. Their last defeat came against champions Chesterfield on 28 January and Worthington, who was promoted to the Premier League with Norwich in 2004, is looking forward to the ties against Graham Alexander's side. "We've had them watched and we know exactly where they're at," he added. "It's about us being positive and there is no reason why we shouldn't be because we are on a fantastic run. It's all to play for."